What are risk factors for occupational asthma? What are symptoms and signs of occupational asthma? How do health-care professionals diagnose occupational asthma? What is the treatment for occupational asthma? What are complications of occupational asthma? Is it possible to prevent occupational asthma? Where can a person find more information about occupational asthma? Asthma is a lung disease characterized by and reversible narrowing of the airways, leading to shortness of breath, wheezing, chest tightness, and cough. Occupational asthma is caused by a specific agent in the workplace. Many different agents can cause occupational asthma. Symptoms can begin immediately with exposure or years later. Occupational asthma is diagnosed by a thorough history and physical exam, combined with lung function testing (spirometry or complete pulmonary function tests). Treatment involves the use of typical asthma medications and avoidance measures for the offending agent. 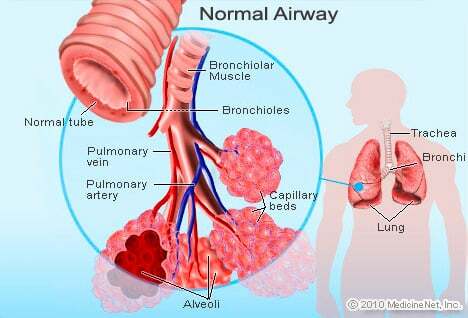 Asthma is a chronic lung disease characterized by reversible inflammation of the airways (bronchi). This inflammation, caused by the immune system, leads to narrowing of the airways, known as bronchoconstriction. Symptoms of asthma include shortness of breath, wheezing, cough, and chest tightness. Occupational asthma is a type of asthma that is caused by exposure to a particular substance in the workplace. Previously diagnosed asthma that worsens at work is known as work-aggravated asthma. There are two main types of occupational asthma: one type caused by an agent that stimulates the body's immune system that then triggers asthma (immune-mediated); and another where the agent directly irritates the airways (irritant-induced). Immune-mediated occupational asthma typically has a period of time (latency period) between the workplace exposure and the beginning of symptoms. This latency period can be from a few weeks to several years. In contrast, irritant-induced occupational asthma usually causes symptoms immediately after exposure. Wheezing is a whistling sound that occurs during breathing, usually during expiration (breathing air out of the lungs) through narrowed airways. Inflammation of the airways, bronchospasm (tightening of the muscles around the bronchial tubes), and hypersensitivity (reactivity to triggers such as allergens, irritants, or infections) all play a role in the development of wheezing. Any conditions or diseases that can constrict the airways can lead to wheezing. Wheezing can be accompanied by other symptoms such as coughing and shortness of breath. Occupational asthma is caused by exposure to particular inhaled chemicals in the workplace that cause the airways to become excessively reactive. There are many agents that can cause occupational asthma. Inhalations of isocyanates, cereal dust, or flour are currently the most common causes of occupational asthma. Agents that cause occupational asthma are usually divided into two different groups: smaller molecules (low molecular weight chemicals), such as isocyanates used in rubber manufacturing, and larger molecules, typically organic substances such as flour. You can find lists of known agents at http://www.hse.gov.uk/asthma/substances.htm. A patient's individual characteristics, as well as other factors in the workplace environment play a role in the development of occupational asthma. One of the main risk factors for occupational asthma is atopy. Atopy is a syndrome characterized by sensitivity to allergens that predisposes an individual to develop occupational asthma. People with atopy often have seasonal allergies or hay fever (allergic rhinitis), allergic skin rashes (eczema), and food allergies. An important risk factor for occupational asthma, which fortunately can be eliminated, is cigarette smoking. Scientists have also discovered specific genes involved with the immune system that may be associated with a person's risk of developing occupational asthma in response to specific agents, such as isocyanates and dust from western red cedar trees. However, there is no role for this type of genetic testing in routine clinical practice. Although the intensity of exposure is important in the development of occupational asthma, it is less clear if it is the amount of the agent, duration of exposure, or frequency of exposures that represents the most important factor. Therefore, for most agents, it is difficult to determine what concentration of agent in the air is considered "safe." Symptoms usually begin with wheezing, shortness of breath, and chest tightness weeks to years after workplace exposure. Often, runny nose (rhinorrhea) and inflammation of the lining around the eyes (conjunctivitis) are present as well and may even occur before any wheezing or shortness of breath develops. Occasionally cough with or without phlegm (sputum) production may be present as well. Initially, patients may notice that their symptoms are worse at work and better during weekends or holidays away from work. If no action is taken, patients may develop constant symptoms. The latency period between the time of exposure to the time of onset of symptoms is highly variable. The latency period for occupational asthma caused by low-molecular weight compounds seems to be shorter than that for high-molecular weight compounds. The latency period for high-molecular weight compounds is often several years. A severe form of irritant-induced occupational asthma is called reactive airways dysfunction syndrome (RADS). This is a condition where the patient suffers a single exposure to a very high concentration of a noxious chemical, usually a gas. 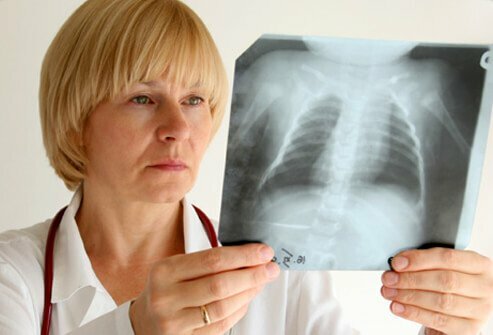 A person suffering from RADS will have shortness of breath and chest tightness severe enough to seek medical attention within 24 hours of the exposure. After recovery from the initial massive exposure, the patient will have airways that remain excessively reactive, or "twitchy," from stimulation by the agent that caused the initial symptoms or other agents. Almost all patients with RADS will have excessively responsive airways for three months, and 50%-60% will still have excessively responsive airways even 18 months later. A thorough history and physical examination is performed for any patient in whom occupational asthma is suspected. Important questions include the type of symptoms, duration of symptoms, timing of symptoms, and factors that make symptoms better or worse. The characteristics of the workplace, including any inhalational exposures, is evaluated. Material Safety Data Sheets (MSDS) may contain helpful information about the workplace. These will generally be on site in your workplace. A test to measure the flow of air in and out of your lungs, called spirometry or a pulmonary function test, may be performed. This test is used to define the diagnosis of asthma. This test may involve giving an inhaled medicine called a bronchodilator to relax or dilate the airways. Alternatively, the test may involve administering a medicine to see how excessively responsive, or twitchy, the airways are (bronchoprovocation test). A peak expiratory flow meter may be recommended to measure airflow during exhalation both at home and at work. Typically, results are recorded daily for a few weeks to see if there is a difference in airflow at work and away from work. Skin tests can be done, where an agent thought to cause your symptoms is introduced below the first layer of skin with a small needle to see if this agent triggers an inflammatory response. However, skin tests are not available for most agents that cause occupational asthma. The mainstay of treatment for occupational asthma is removal from the exposure. Most patients with occupational asthma will get worse over time if they remain exposed, so avoidance of the trigger is important. This often means changing jobs or changing the particular duty at the workplace. Occupational asthma can be treated the same as regular asthma, with inhaled medicines called bronchodilators that open (dilate) the airways as well as inhaled anti-inflammatory medicines (glucocorticoids). However, the most important intervention is to avoid any further exposure. Respiratory masks do not prevent symptoms of occupational asthma. Occupational asthma becomes worse over time if the patient continues to be exposed to the offending agent. After a person becomes sensitized, even very small amounts of the offending agent are capable of triggering significant symptoms. The airway constriction (bronchospasm) can be life-threatening if severe. After avoiding any further exposure, most patients will have improvement in their asthma over a span of months to years, but it is rare that occupational asthma will completely go away. People who were exposed to lower levels of an offending agent for shorter periods of time are more likely to experience eventual improvement in their asthma. Occupational asthma can be prevented by monitoring levels of exposure in the workplace, which may help employees from becoming sensitized to the agent. Many potential agents can be monitored continuously. Close monitoring of employee symptoms and prompt removal from the environment once symptoms arise will help prevent occupational asthma complications and maybe reduce its severity. All smokers are advised to quit smoking, and this may help prevent the development of occupational asthma. Balmes, J., M. Becklake, P. Blanc, et al. "American Thoracic Society Statement: Occupational Contribution to the Burden of Airway Disease." Am J Respir Crit Care Med 167 (2003): 787-797. Bherer, L. "Survey of Construction Workers Repeatedly Exposed to Chlorine Over a Three to Six Month Period in a Pulpmill: Follow Up of Affected Workers by Questionnaire, Spirometry, and Assessment of Bronchial Responsiveness 18 to 24 Months After Exposure Ended." Occup Environ Med 51.4 (1994): 225-228. Bignon, J.S. "HLA Class II Alleles in Isocyanate-Induced Asthma." Am J Respir Crit Care Med 149.1 (1994): 71-75. Brooks, S.M. "Reactive Airways Dysfunction Syndrome (RADS): Persistent Asthma Syndrome After High Level Irritant Exposures." Chest 88.3 (1985): 376-384. Ingelfinger, Julie R. "Occupational Asthma." NEJM 370 (2104): 640-649. Maghni, K. "Airway Inflammation After Cessation of Exposure to Agents Causing Occupational Asthma." Am J Respir Crit Care Med 169.3 (2004): 367-372. Malo, J.L. "Agents Causing Occupational Asthma." J Allergy Clin Immunol 123 (2009): 545-550. Malo, J.L. "Natural History of Occupational Asthma: Relevance of Type of Agent and Other Factors in the Rate of Development of Symptoms in Affected Subjects." J Allergy Clin Immunol 90.6.1 (1992): 937-944. Moscato, G. "Occupational Asthma: A Longitudinal Study on the Clinical and Socioeconomic Outcome After Diagnosis." Chest 115.1 (1999): 249-256. Muller-Wening, D. "Protective Effect of Respiratory Devices in Farmers With Occupational Asthma." Eur Respir J 12.3 (1998): 569-572. Venables, K.M. "Smoking and Occupational Allergy in Workers in a Platinum Refinery." BMJ 299.6705 (1989): 939-942. Vendeplas, O. "What Are the Questionnaire Items Most Useful in Identifying Subjects With Occupational Asthma?" Eur Respir J 26.6 (2005): 1056-1063. If known, what was the cause of your occupational asthma? Do you work in an environment that puts you at risk? Please describe your occupational asthma signs and symptoms. What treatment have you received for occupational asthma? Please share any steps you've taken to prevent occupational asthma. COPD (chronic obstructive pulmonary disease) and asthma both have common symptoms like coughing, wheezing, shortness of breath, and a tight feeling in the chest. COPD is caused by tobacco smoking, while asthma is caused by your inherited genetic makeup and their interactions with the environment. Risk factors for asthma are obesity, exposure to cigarette smoke (even secondhand smoke), and personal history of hay fever. There is no cure for either disease, but symptoms can be managed with medication. A person with asthma has a better prognosis and life expectancy than someone with COPD. The most common food allergies are to eggs, nuts, milk, peanuts, fish, shellfish, strawberries and tomatoes. Symptoms and signs include nausea, vomiting, diarrhea, abdominal pain, itching, hives, eczema, asthma, lightheadedness, and anaphylaxis. Allergy skin tests, RAST, and ELISA tests may be used to diagnose a food allergy. Though dietary avoidance may be sufficient treatment for mild allergies, the use of an Epipen may be necessary for severe food allergies.